Handwritten forms, spelling errors, manual entry, permission for access, even lost information. These are some of the issues that plagued old special education record-keeping methods. Now many of these issues have been eliminated with the use of the information sharing software called Tienet, said Kent ISD’s Assistant Director of Special Education Rebecca McIntyre. 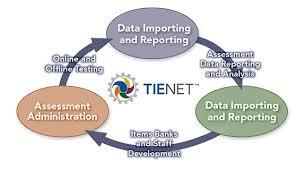 Tienet allows information on special needs students to be updated in real time, across a Kent ISD network. If a student participates in programs in multiple districts, their information will be accessible to teaching staff at each location through an online database. This allows staff to spend more time teaching and less time tracking down documents. In special education programs, details about each student, including medical and behavioral traits, can change often. These changes can affect each student’s Individualized Education Program (IEP), one of the many federally mandated requirements for special education reporting. As student’s records get updated in Tienet, the changes are reflected immediately and are accessible to every educator in contact with the student. Special education teacher Susan Varga from Sparta Area Schools said Tienet made her job a lot easier by making a student’s information readily available for teachers and everyone else working with the student, such as therapists, social workers, and administrators. She explained that a student’s transition from one district to another is much easier when the information about them is available instantly.”This program is much more effective and efficient than the old paper forms,” she said. Tienet is also improving the way students get admitted to programs. “The forms are written to be more parent-friendly,” said McIntyre who explained that in the past, parents would fill out multiple and often confusing forms, which would then need to be evaluated (and sometimes deciphered) by an instructor, entered manually, and used to create the IEP. “Parents have a (better) process they can follow now,” McIntyre said. Parents can fill out a digital form to be sent directly to instructors, who then create the IEP draft, which gets sent back to parents for review. Parents are then able to ask questions about and suggest revisions to the education plan. Another benefit of using Tienet is accurate Count Day results. Count Day is a snapshot of how many students attend the school, which translates into funding for the district. For a schools general population, Count Day results rely on the student’s physical attendance at school. In special education departments, students may be attending a different program during Count Day or may not be able to attend during that time frame. Data kept in Tienet can be used in lieu of attendance, said McIntyre. “Some of (their) information changes often. The Tienet data is updated in real time,” she said. Tienet has also helped improve communication between districts and Medicaid programs, where up-to-date information is crucial. McIntyre explained that historically, communications with Medicaid service providers regarding student data has had issues. She said Medicaid providers are telling her that things have improved greatly. Adrian Hirsch has been with SNN since its launch, starting as an intern from Grand Valley State University where he received a degree in broadcasting and business. After the internship, Adrian was brought on as staff to continue reporting, editing and publishing stories for SNN and Kent ISD. Adrian has been active with community radio station WYCE for years, served as Non-Profit Coordinator for GRTV, and currently works as the Web Producer for SNN.